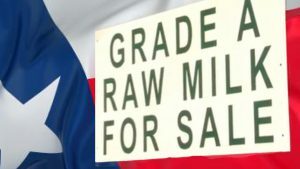 The Texas Department of State Health Services has announced that it plans to make changes to the regulations that govern raw milk. The agency has NOT shared what changes it is considering. This means that it might address the issues we have been raising for several years, namely delivery and sales at farmers’ markets. The changes could also go far beyond those, and be very positive, very damaging, or some combination. Any provision in the raw milk portion of Chapter 217 is up for consideration – the sanitation requirements, testing standards, inspection frequency, permit fees and fines, etc. Step 1: The agency is accepting public comments until Tuesday, March 6. See below on how to submit comments. Step 2: The agency staff will consider the public comments and develop a proposed rule. Step 3: The proposed rule will be published in the Texas Register and the agency will again accept public comments. During that time period, there will be three public meetings: In Austin, Tyler, and Lubbock. Step 4: After the public comment period and meetings, the agency will consider the comments and then finalize its rule. Both comment periods are very important. This first one is the best opportunity to influence the agency’s thinking in favor of positive changes – once the agency has written its proposed rule, it’s much harder to change its mind about whatever positions it has taken. Email your comments by March 6 to Sofia.Stifflemire@dshs.texas.gov or Rod.Moline@dshs.texas.gov. Or fax to (512) 834-6756, to the attention of either Sofia Stifflemire or Rod Moline. Please send us a copy, too! Email it to Judith@FarmAndRanchFreedom.org. It really helps for us to have a record of everything that was sent to the agency. Raw milk farmers: Take this opportunity to think about the regulations that govern you, as a raw milk producer. What is working well? What isn’t working well, and why? What facts or experiences can you share to explain the problems clearly and make them concrete? What would be the solution? Try to address one issue at a time, to keep it clear and understandable. Raw milk buying clubs and consumers: The agency knows that there is public demand for off-farm sales options, so simply burying them in comments about that won’t help – save that firepower for the second round, when we might need it to fight off bad changes! Right now, only send a letter if you have a specific story to share about why the current regulations are particularly burdensome and inappropriate. Keep it short and focused. Alternatively, if you are a medical professional, consider sharing a short letter on why you support raw milk access. Thank you all for your activism!